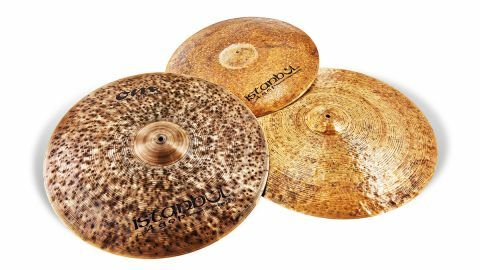 Big cymbals are fashionable and these two Agop signature rides display contrasting qualities for the discerning stylist. Istanbul - the cymbal company - was founded in 1980 by Agop Tomurcuk, previously foreman at the K Zildjian factory in Istanbul, Turkey. The 30th Anniversary series therefore was initiated in 2010. Here we have the latest addition, a whopping 26" ride, accompanied by two updated Signature rides - both also biggies - a 23" Matt Chamberlain and 24" Cindy Blackman-Santana. Agop Tomurcuk died in 1996 and Istanbul's Product Specialist, Burak Ersoz, tells us that Agop left a notebook containing "a lifetime of cymbal making secrets and ideas for the eventual creation of the Signature series. These cymbals are made according to his exacting specifications". As regards the sizes, Burak says the demand for larger diameters is growing and Istanbul has made 26" rides previously in other series, eg: the Traditional and Custom. Cindy Blackman previously had a 22" Om ride and this expanded 24" is in dark bronze with deep black lathing grooves, irregular hammering both sides, plus a low profile, unhammered bell. Matt Chamberlain's unusually sized 23" ride has more of an earthy vibe, lacking the lathing, but with densely packed leopard spot, shallow hammering and a raw chalky bell. Matt's previous ride was lathed on top, but unlathed below. The magnificent 26" 30th Anniversary offering is lathed and irregularly hammered top and bottom - including the bell - and has a gorgeous old gold vintage finish, the result of a special pre-aging process. Burak explains that the Anniversary is the most traditionally crafted of all Istanbul's series, distinguished by hand-pressed bells (bells are usually machine-pressed). While the cymbal is still hot, one craftsman holds the bell mould centrally in place while another hammers in the bell shape. This hands-on vintage process ensures each cymbal is unique and also partly explains the eye-watering cost of the cymbals. Burak adds that in order not to distract from the vintage look there are no brand logos applied, just the tiny cold stamp which identifies the cymbal. This 26" Anniversary is the biggest ride we've ever grappled with in terms of breadth of sound - so much spread, so much depth, so much everything. To give you an idea, the oceanic spread, the roar of complex body tones, mean that even if you play it really, really softly with the lightest stick, while the stick still responds precisely, the hissy wash, like my tinnitus, never really goes away. Controlling this surf-like wash is key then, but if you want the ultimate velvety warm, trashy, spready ride, here it is. The bell being hand-hammered has more of a contiguous bond with the cymbal body than is usually the case. The whole massive cymbal feels as one. I'm not sure who would use it (wealthy collectors aside), but it is a fabulously rich, darkly blending, all-enveloping beast. he other two signature offerings have a harder edge, a tickier tip-sound. By opting to lose the top lathing and going for an all-over raw finish, Matt Chamberlain's ride is drier and more focused than previously. The ride tone is slightly metallic, but is accompanied by a full, trashy undercurrent. Tap near the edge for a precise stick response with a small amount of spread. Move onto the shoulder and there is much more body, almost a crashing sound. The bell is dry but tuneful, the full crash extremely dry and quite abrupt. Again, not your average cymbal, which is what you want in a signature instrument. As a lifetime admirer of Tony Williams, Cindy Blackman-Santana's 'Om' ride reflects the deep and yet attacking dry ride of that much-missed innovator. As well as growing by 2" it is "a little heavier with a larger bell for increased stick definition, but otherwise retains the tone and profile of the earlier 22" signature".This is warmer than Matt's cymbal but not as mellow as the Anniversary. This time the bell really pings out, contrasting nicely with the body, which is dusky yet lively all over. The crash sustains rather more than Matt's, and is warmer. Stick definition is always crisp, despite the big wash. It's the pick of the trio for us - at home in more traditional jazzy-bluesy- fusiony-Latiny scenes, while Matt's is perhaps more cutting edge, harder and left-field.